There, cutting the sapphire sky like a feathery dagger, an immature peregrine falcon snapped me out of a driver’s daydream. Watching him dart after his prey I remember learning just how many birds of prey make their home on amazing Crete. Then, at this exact moment, my wife Mihaela snatched at my arm from the shotgun seat, “Stop the car, Phil.” Pulling to the side of the narrow mountain road, we stepped from the car to looked out across an unbelievable valley, and at a rocky butte that framed by a vivid spotlight from the sun. 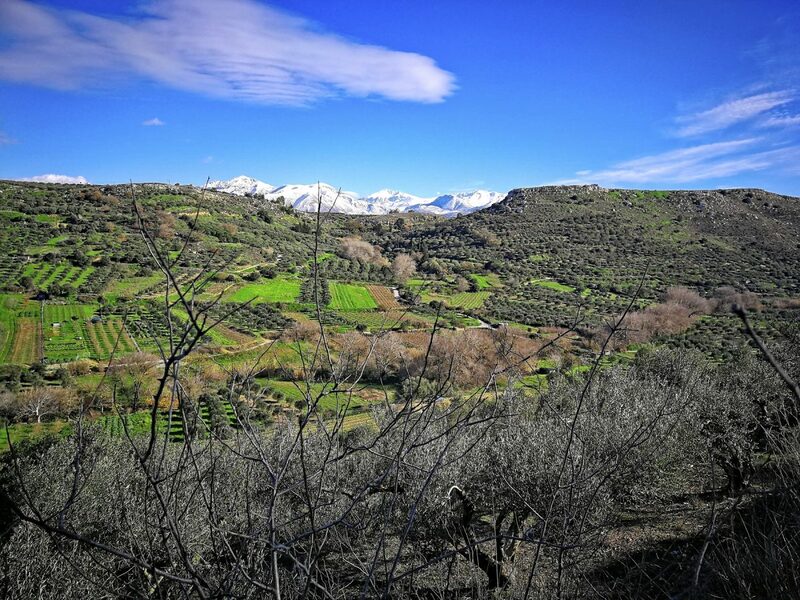 As if entranced, Mihaela, our little boy Paul, and I stood on the steep slope of a massive olive orchard looking toward what the almighty was surely pointing to. Crete island is a multifaceted mystery, a layer cake of human civilization made up of more than 5,000 years of history, tradition, and culture. Since moving here in 2017, I’ve taken my family on missions of discovery nearly every weekend. 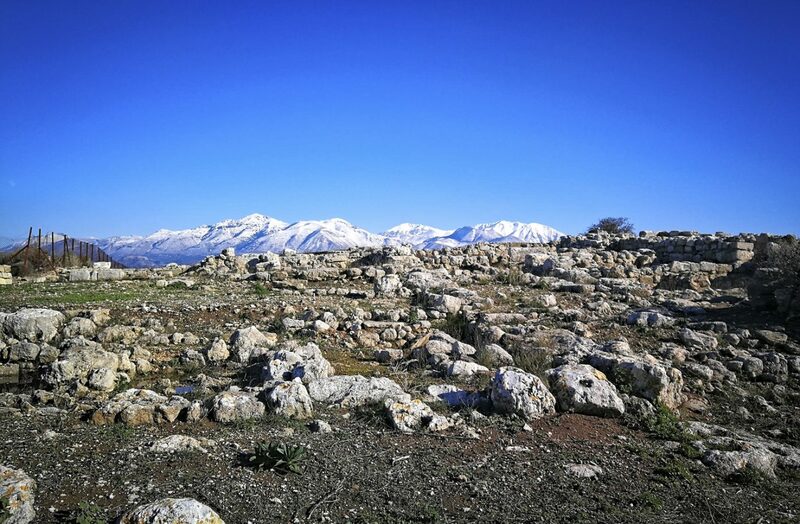 Our most recent exploration from the capital here in Heraklion was a family day-trip to find a lost Minoan city hidden in the hills overlooking Crete’s heartland. I’ve made it a kind of mission to follow, amateurishly, in the footsteps of the great archeologists of Crete, to try and visit all the places where Knossos chronicler Sir Arthur Evans trod, and to try and connect with the Cretan people as the legendary J.D.S. Pendlebury did. 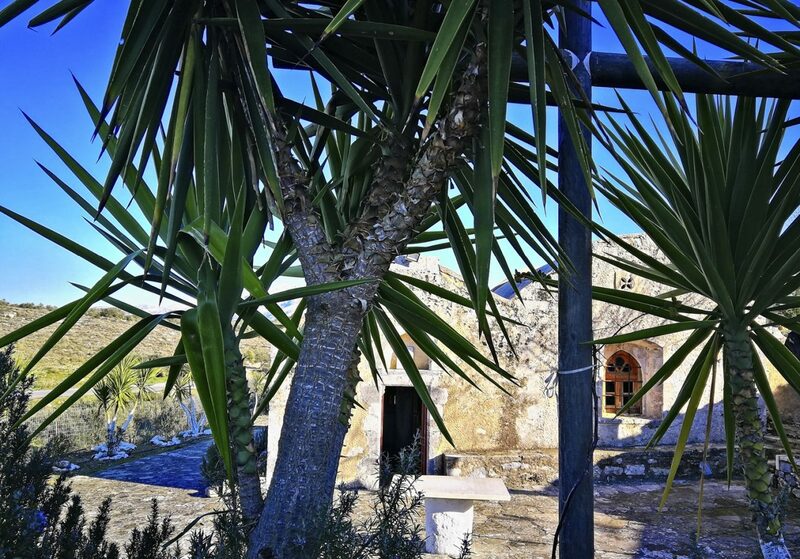 On this sunny Saturday, we set out to see Crete’s most recent palatial discovery, the Palace at Galatas, which was only discovered by chance back in the early 1990s. By the end of the day, we ended up rediscovering the timeless and unmatched richness this island is blessed with. Having lived here some months, we find ourselves in tune, listening to a peculiar whisper from somewhere in the middle of this Keftiu (or the Biblical Caphtor). Our most recent journey took us far off the beaten path to farms and villages few tourists have ever seen. Spurred by our past discoveries, my wife Mihaela, our son Paul, and I felt sure we’d stumble over something unbelievable on our question to visit a lost palace of the Minoan kings. We set out on a bright Saturday morning in our little Ford Ka toward the tiny village of Galatas, which is just 37 kilometers south of our home. Setting out toward famous Arkalochori, where once a vast treasure horde of ceremonial Minoan weapons had been discovered in a sacred, and now famous cave, the three of us marveled for the umpteenth time at the majestic Cretan landscape. Crete is, for most travelers who take the time to venture inland, an unmatched landscape where sunrise and sunset take on new meaning. Most people learn about the island because of the dozens of perfect beaches here. It’s true, the perfect seascapes of the island call loudly, as they should, but the soul of this ancient island whispers from the mountains that rise up and hold up the azure skies. In fact, the ancient Egyptians inscribed the unique character of Crete, which was called Keftiu millennia ago, on the walls of the pharaohs’ tombs. Down the narrow winding ribbon of the road past the mighty Palace at Knossos we drove through the amazing Kairatos River Valley. Next, we puttered past the village of Archanes where Minoan kings summered, and up onto the main road toward Arkalochori, we rode. A few kilometers from Arkalochori we got lost on a deserted road overlooking an unbelievable valley. It was on this road that little Paul had pointed up at the ridge where a giant sunbeam shone on the rocky cliff, exclaiming, “Look, God is lighting the way for us!” Sure enough, the magic of the moment is what caused Mihaela to demand we stop. The image above is of this place, only later after the sunbeam had subsided. We stood there as if under some kind of spell, looking across the valley toward Galatas. Then, reassured we were on the right path, we drove on to Arkalochori, and farther along to the sliver of a road where Google Earth had shown me the Minoan site days before. Mihaela and Paul, now half starved to death, had become a bit less adventurous by the time we reached the dirt road that led up to the ruined palace, so at the first mud hole we encountered, turning back seemed the better part of valor. We drove on to the tiny village of Galatas, where we all prayed an open taverna awaited us. Luckily, the fates and the spirits that inhabit this island were with us. 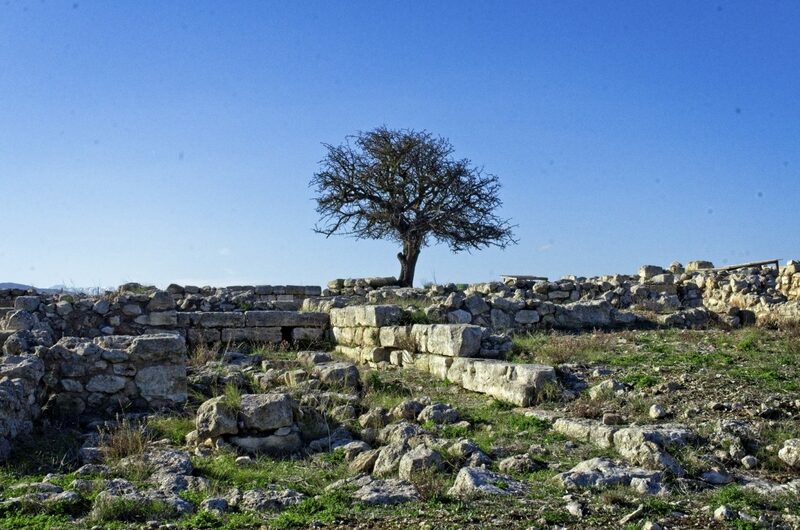 How could we have known our quest to find the ancient holies would lead us to The Small Olive Tree (Cretan dialect: Το μουρέλο του Λαδωμένου), and unbelievable new friends? Once again, Crete had lessons for us. From the instant we stepped from the street into the quaint interior of Markos Ladomenos, I sensed there was something unique about the place. Mig (Mihaela) commented, as well, at the roaring fireplace and especially once Popi, the beautiful daughter of Markos appeared wearing a smile to light up a rainy Cretan day. 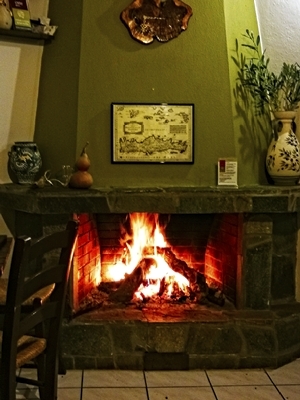 The best way to convey this family owned taverna’s unbelievable charm is to tell you that 15 minutes after we sat down in front of the cozy fireplace, we were pals with all the patrons, Popi, her Dad and Stepmom, and her amazing husband, Grigoris, who is the chef. These are the sweetest people, and their goodness overflows into the traditional Cretan cuisine they serve. 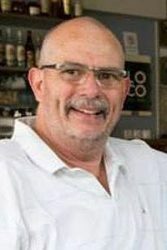 Between us, Mihaela and I have reviewed over 50 restaurants and tavernas on Crete, and while some of our favorites ones cannot be outdone for their specialties, only one I can think of even holds a candle to the overall magic Grigoris puts onto the tables at The Small Olive Tree ( Το μουρέλο του Λαδωμένου. This tiny eatery is like Heraklion’s most famous Peskesi, but with a gigantic heart and no pretense. Markos’ place is the Heraklion Prefecture version of lovely Aravanes in Rethymno Prefecture, which is the best compliment I could ever give. But food, no matter how amazing, is not the “sacred” gift I am writing about today. You’ll understand before story’s end. Remember, our “mission” was to explore a lost Minoan city originally, but the road to Galatas Palace was too treacherous for our little Ford Ka. So, Markos suggested he drive us up on the mountain in his 4-wheel drive pickup truck. We’d known these people exactly 20 minutes. I guess you are catching up with me now, but the sacred love Cretan people feel for strangers gets still more riveting. By the time we finished socializing with new friends at the adjoining tables, and getting to know Markos, his wife Giota, Popi, and Grigoris the sun was about to set, so we could not take Markos up on his offer. “No worries,” Grigoris told us, but we had no idea what he had in mind for a postponed archaeology adventure. A week later we re-learned what sets Crete apart from anyplace on Earth. The week following our initial excursion to Galatas, Grigoris called to say he had organized a trip up the mountain to the archaeological site for the three of us. Arriving on the appointed day, we were surprised when he and his father-in-law Markos told us we would not only visit the Minoan site but that they had planned a whole day of activities in order to show us some of the area’s most noted treasures. As we three climbed aboard Markos’ pickup truck alongside Grigoris, I could not help but try and recall any such previous experience. As the day unfolded, I was more and more amazed at the unbelievable kindness and caring of the Cretan people. 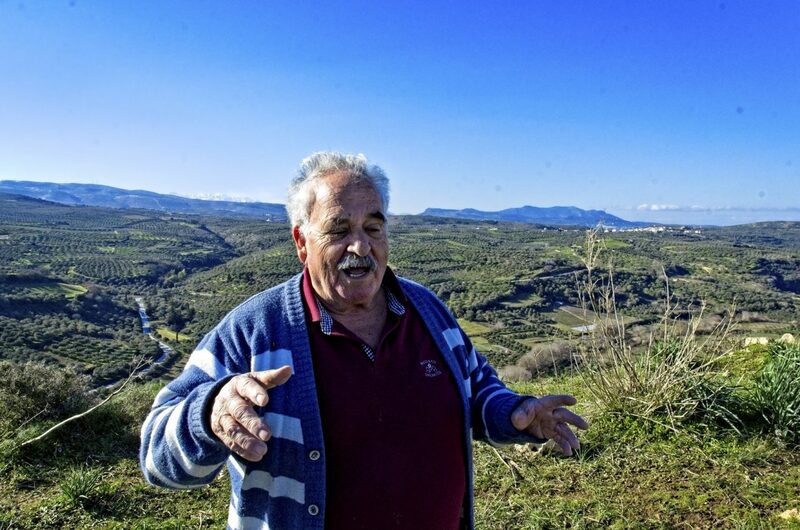 As we bounced our way up the rocky road, cut into the slope of a butte a few hundred meters outside Galatas Village, the spirit of exploration seemed to grip everyone aboard including the patriarch Markos. Driving like a veteran rally racer, the elderly tavern owner managed to quickly deposit us right in front of the fence the archaeological teams had erected to protect the site. He and Grigoris had originally planned to ask somebody from Heraklion Museum to meet us for a guided tour, but short notice had made that impossible. So, walking around the site, we were all struck by the magnitude of location and Minoan ingenuity as we learned over the chain link to snapshots with our phones and my Nikon. Most of what’s visible of the palace is from the Neopalatial period, built about 1700 BCE. Underneath, however, a thriving settlement and earlier palace-like structures once dominated the entire hill we found ourselves standing on. Paul, our 10-year old, was absolutely enthralled with the view from this high perch. We could not get him to come away from the edge of the precipice, but his observations are a subject for another Minoan tale. Another interesting reaction to the ruins came from our guide Markos, who stood stoically looking out onto the landscape from time to time as we walked. As it turns out, he told me, he’d driven his father’s animals up to this summit many times, and he’d never caught even a glimpse of the ruins that lay buried beneath the fertile soil. The place had an effect on all of us; I can tell you that. Before leaving the site, we all commented about how there is something spiritual, even supernatural about the place. But again, this is something for deeper study. At this point I can only tell you, there is something amazing at this Palace at Galatas, just what I cannot say just yet. Daylight burning, off down the mountain we drove toward a small monastery a couple of hundred meters from the Minoan site, a place Markos said shepherds used to water their animals from a holy spring that rises up from the bedrock. Once again we were surprised that no guidebooks mention Agios Ioannis Chruch, a small medieval looking edifice Markus assured us was once a full-fledged monastery. But then, the island is full to the brim with such small discoveries dotting the landscape. Markus took us inside, we all lit some candles, and we climbed back aboard the Toyota 4×4 and headed back to explore the old part of Galatas, the upper part of the town where Markos grew up. Walking the narrow streets of Galatas, once again we were all three struck by the history that covers every square inch of Crete. In the abandoned part of Galatas, Venetian influences cohabit with Ottoman influences, which are in turn readapted to the Cretan personality. One after another, we passed a procession of fabulous stone houses, most of which had fallen in over time. At length, Markos carried us to the home of his childhood, a solid rock domicile overlooking the valley reaching out below. It was here he showed me the same bed he’d slept in until the time he left Crete for Athens, the springs and rusted from of which was exactly where he’d left it in 1963. Winding our way along these abandoned streets, I could not help but get sentimental when Markos described every centimeter of the place, with Grigoris translating for him. His life, like yours and mine, has been made up of chiseled moments etched in the mind. It seemed to me that day, Markos longed to share them with people he perceived cared. He was ultimately right to do so, for we surely did. The giving of these people is something that never ceases to amaze me, but what you take here ultimately forces a good person to want to give back. Again, this is a story for another time, and I just wanted to mention the dynamic here. What an amazing experience this village tour turned out to be, one that prompted Mihaela to tell me when we arrive home, “I want to buy one of these ruined houses, I will tell you why later,” she informed me. The day moving on, once again we loaded up in the pickup, this time headed down into the valley to an iconic place on Crete. The monastery of Agia Marina is one of the most famous, and the most visited monastery on Crete. Each year over 100 thousand pilgrims travel to the sacred site from all over the world, for the day of the feast, July 17. Located just beneath the cliffs in front of Galatas, the monastery sits a few hundred meters from the village of Voni. This sacred place turned out to be our next destination (after we 4×4 crawled some back roads) on a day we never wanted to end. Arriving in front, Markos parked his truck and headed inside to seek out a nun named Marina, the last holdout of 10 caretakers that once oversaw the monastery. In her 80s, certainly, Marina seemed thrilled to have visitors to show off her beloved holy of holies to. A small sanctuary she led us to housed a miraculous spring and shrine she assured us had seen many miracles over the centuries. By the time we were ready to leave, we felt certain the elderly nun knew exactly that of which she spoke. “What a precious spirit that old lady has,” I remember thinking. Some readers might find it uplifting, the fact that two minutes after Mihaela said a prayer and sipped the precious water from the spring, a new client called her to employ her writing skills. No, I am not kidding. I will not divulge the prayer, but the answer proved exactly appropriate. Ah, the revelation, you ask? Well, here’s the thing. God lives here on Crete, and in a big way. I know you may be skeptical for any number of reasons, but I assure you what I am saying is true by all I know. That said, the area that lies beneath this ancient Minoan city is possessed of a spirit I can only describe as absolute peace. All of us have experienced a fragment of this existential component, but at Galatas there’s something deeper than a momentary reprise. I’ve experienced this feeling at the Palace at Knossos, at Malia, and at Phaestos too, only to a lesser degree. The feeling is something I at first equated as a happy emptiness, only now that we’ve visited Galatas and the surrounds, I understand more fully what it is. Whatever compelled those ancient people to sanctify this valley and the mountaintop overlooking it, it absolutely had to be from a higher place. Marina the nun, Kostos the child roaming the hillsides, Kostos the aging man being the good Samaritan, and my little boy drawn like a dragonfly to the Minoan overlook, what was a Protopalatial community before Knossos ruled Crete, it’s a resonating echo quietly repeating something eternal across this valley. Okay, you think I am crazy, but if you come to this place open-minded, you’ll thank me later. I watched quizzically as Markos sat across from me, his tough hands folded around the back of his wooden chair as he stared into the flickering fire. Not a move did he make for several uninterrupted minutes, the shimmer of flames in his luminous eyes was the only detectable trace showing he was not a statue. Hypnotized, I joined him in the ritual wantonness of thought, in the trance of fire gazing we’ve all known. Only this seance at the end of a perfect day was different somehow. Mihaela and Paul were in the kitchen of the taverna helping Grigoris (at right lighting the grill) prepare a feast of unbelievable Cretan cuisine, and Markos’ sweet wife Giota was fetching more firewood as the two of us communed with this “peace” I mentioned. Then Paul delivered a dish of apaki (smoked pork) that was irresistible. Grigoris had recruited Paul to be the chef in training, and Mihaela was living out a moment of her life’s dream, to have her own taverna. In the ensuing hour, our little boy put in front of us some of the most amazing food any of us had ever tasted. 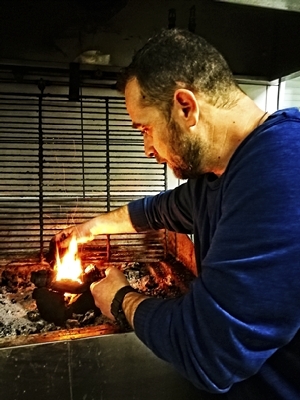 You cannot imagine the flavors Grigoris conjures out of his joy of creating food joy. The flavors are unbelievable, this is all I can tell you. Savory meats to impeccable salads, Horta, even a special omelet were conjured for just us – the Indiana Jones archaeologist wanna bees. Sitting there, the six of us in a tiny taverna on a mountain ridge in the middle of Crete, in a village where all the young people have left the older ones to make do – well, maybe what I am trying to convey is something you have to feel for yourself. Contentment, especially for restless Leonine spirits like Mihaela and I, it’s sometimes an elusive experience. Not in the shadow of that Minoan mystery, the archaeologists figure they understand. You can sit and start into the firelight in this place forever, trust me. Now I know why my pal Kallia loves the hills around Arkalochori so much. Eternity is here.